Stem 2 to 5 feet high from a slender rootstock, jointed, pubescent when young, becoming smooth. Leaves ovate, thin, palmately five to nine-ribbed, dark green, entire, deeply cordate at the base, acuminate, 3 to 6 inches long, 2 to 3½ inches wide; petioles sheathing the stem at the enlarged nodes; the stem terminating in one or two elongated white spikes, their tips drooping in flower. 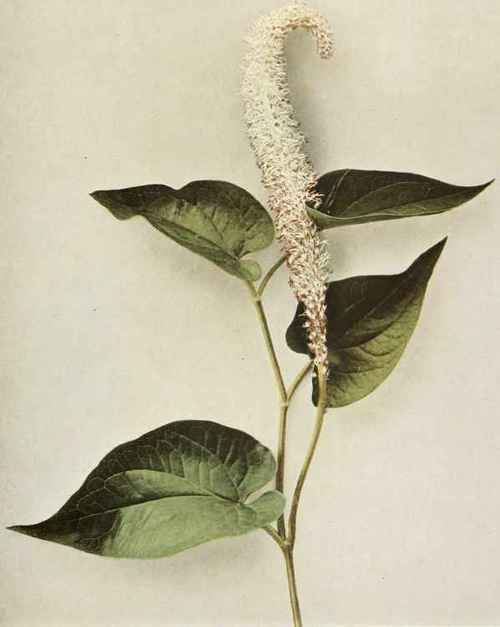 Flowers fragrant, small, white, without any perianth; stamens six to eight, white, spreading; ovary consisting of three or four carpels united at the base, becoming slightly fleshy and strongly wrinkled in fruit. In swamps and shallow water, Rhode Island to Florida west to southern Ontario, Minnesota and Texas. Flowering from June to August.